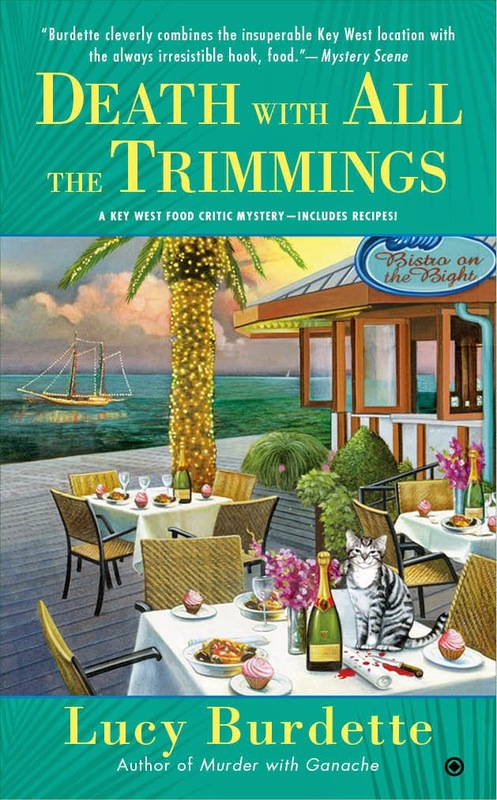 Recently I read a post on Facebook in which readers were admiring the brand-new cover for Lucy's fifth Key West mystery, DEATH WITH ALL THE TRIMMINGS. But one ignorant person asked: Is there a rule that a cat must appear on every cozy mystery cover? Anyway, if cats aren’t important, then why in the world were there 6 or 8 emails going back and forth between Lucy and her editor trying to decide which expression should be on my face? Summer is here and the bloggers at Killer Characters are ready to celebrate. During June and July, we're having a Cozy Days of Summer Giveaway. There will be a winner every day. Leave a comment before midnight to be entered in that day’s drawing. Hurry! Because at midnight, the next drawing starts. As someone with an allergy to cats, I'm don't know if I think they have to be in every cozy. Although I do like them because they make you feel all warm inside. I'd have one - if I weren't allergic. Out of loyalty to the Pug, I can't say only cats should be in cozies, but a pet sure helps. I kind of like the fierce cat face. I'm all caught up with Hayley and can't wait to read Death with All the Trimmings. I think a pet of some kind should be in every cozy just because I love furry friends, and the inquisitive, independent cat certainly mirrors the heroine sleuth in many ways, making it a perfect fit for a cozy. Oh, and I think the fierce face cover is terrific, but I can see why you went with the smiling one. Having read the entire series, I would love to win Death with all the Trimmings. Thanks for the giveaway! The smiling face cover is much better. I agree that all cozies should have some kind of pet. My dogs will argue that the pet should always be a dog. Love this series and looking forward to the next release. I'm in love with a red tabby named Joey, so of course I think that all cozies should have at least one cat, and the more the merrier! Cats add warmth and personality to cozies. I love stories that include cats. It could be because we have two cats in our home and I cannot imagine a home without cats. I'm looking forward to reading this series which is new to me. Cats and cozies entwine around each other for that warm, satisfied feeling, but cats also represent the ability to surprise with a clawed swipe, as do cozies with an unexpected murder. I've always been a dog person but I like books with animals in them. Cats are mysterious creatures and they just seem to fit with cozies. I love seeing them on covers. For this giveaway I'll take whatever book you want to send me, but preferably the first one in the series. Hey, beggars can't be choosers!! Cats are smart and good problem solvers! I would love to win Death With All the Trimmings. There is nothing better than petting an animal, whether it's a cat or another animal, to help think things through. Cats are inquisitive and that makes them good mystery partners. Looking forward to reading many more in this series! Cats are great. They can be so friendly or so quiet and then deadly. Love my cat. I would be lost without my cats. They all have different personalities and always pick you up when are down. They make me laugh. They are great stress relievers. You need all the help you can get when solving a mystery and cats are great at mysteries. Cats and cozies both require cunning and stealth. Both are hunters. A cosy without a kitty is like shredded wheat without milk! Dry and boring! I think I already won the new book, but any cozy is fine with me! 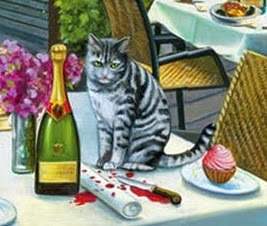 I do like cats in cozy mysteries, they bring that extra piece to it. I'd love Murder with Ganache, sounds wonderful. Thank you for the giveaway! Cats are independent enough to fend for themselves while their Humans are out trying to solve the mystery. I just finished Murder with Ganache so I can't wait to see what happens in the next book. Such an awesome giveaway! I am adding so many books and authors to my Need To Check Out list! A cozy with a cat is fine with me. Evinrude, when I first started reading your post I thought you were Lucy and I didn't understand what she was saying. Now, I get it. First of all, I don't think cats are on the covers of all cozy mysteries (as I look at my desk and see a cat on the cover of the last one I read.) I seriously think cats are pretty smart. I mean some even help to solve the crime. So glad they got you to smile on the cover. Would love to read Murder With Ganache. Thanks for the giveaway. We have a cat and a dog, so if books have one of each, or more, that's a draw for me. I'd love the new book in the series! Oh, I like the smiling expression on the cat. What would the cover of your books be without a cat.....incomplete. I have 3 cats, so as they say cats rule! And wonders why ALL books don't have cats in them? I would love the first book in the series, thank you!! Becasue cats rule, is why! How many cats do you know who write their own blogs??????? Cats should not only be IN them, they should WRITE them! And don't think for a minute theycan't. cats and cozies go together because cats are smart and inquisitive and they add to a good story line. Cats and cozies, there is no more purrfect combination in that. Cats are intelligent and curious, that is why they are great cozy critters. Evinrude, how can there be any question? EVERYTHING looks better with a cat! I think the pose they chose (hey! It rhymes!) is a good one--particularly flattering, showing off your winsome charm. I'm patient. I can wait to be surprised by the arrival of the newest book. Cats or even dogs need to be in cozies so there is a true comforting feeling. I like cats on cozy covers. I always enjoy seeing them. The smiling cat is nice. I am a cat owner. What's the origin of the name Evinrude? Unusual name. Pets provide a comfortable feeling which is one of the things we love about cozies. I like cozy mystery with cats in them and also without them. What a ridiculous question!! I wonder when I see a cover with no cat. haha I am kidding. But why would someone ask such a silly question?? I love hearing that you had such a time deciding on the expression. Love it! I would love to read An Appetite for murder!!! *woooo while wiggling fingers* I love a mystery. My recipe was chosen to be included in The Diva Wraps it Up. thanks Krista for the complimentary book. Cats are in all the best cozies---and of course, they should be on the cover. Cats belong on cozies because they are the sweetest, most precious of God's creatures. I lost my kitty of 17 years and I miss her so much. I will buy any book with a cat on the cover. Any book you send will be appreciated. I really like this series. I got Murder with Ganache yesterday. cats always make me buy the book--they just catch my eye! I live in a house with 4 dogs and 5 cats. Cats always have that look on their faces that says they've got it handled. them to use their sixth sense to ferret out lies and danger. Not to mention they look so darn adorable on the cover and draw readers to the book. "M" likes to cozy up to me while I read. So reading a cozy with a cat is a great idea. FYI "M" is my son's cat's name because he is m-azing. Cats are cozy! There's nothing better than curling up with a good cozy & a hot cup of tea & having your cat curl up with you! Don't enter me, but I love, love this series. A home without a pet is not a home. A home without a cat is sad indeed. I have had cats as part of my life for all my 56 years and would never consider life without a cat . Cats are Intuitive. Smart. Loving and humorous. They give joy to our lives. For me a cozy without a cat is not the same. A cozy with a cat assures me that a intelligent compassionate protagonist is one I can relate to and revisit as I know the cat will enrich and give humor as well as comfort to the series.We that understand and are blessed by our cats look forward to reading cozies with cats. After all Evinrude would agree . I love cats, and enjoy seeing them on covers. I don't think anything Key West oriented would be without a cat; they are part of the local vibe there. I love cats and they seem to see everything going on around them so they fit like that.They can even give you little signals about some things.If I win, I would like the first in this series.I haven't been able to read any of them. Cats are mysterious creatures. So pairing them with cozy mysteries just makes sense. And add in that there is always a murder, cats fit in there too. Remember The Godfather had a cat. I've not read this series yet. But I'm still kinda new to cozies and am learning all of the different series. I would love to get the first one in the series, An Appetite For Murder.